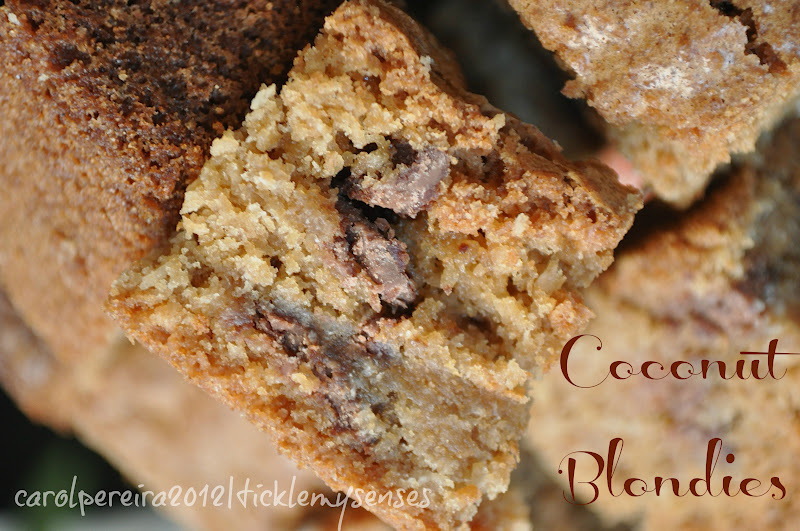 Tickle My Senses: Coconut Blondies. Well its the end of a non existent summer in the UK, as is every year. And even after all these years I still cannot get my head around to what to wear while leaving the house.....when I'm dressed for rain..its dry as a dessert, and when I dress up warm...its cold as hell...hmmm...guess as the saying goes "In Britian the weather changes with the blink of an eye" lol!! Well all said and done, I've enjoyed some wonderful days out, at some awesome food festivals in an around Dorset. The Dorset Chilli Festival, Sturminister Newton Cheese Festival and the Dorset County Fair have been truly enlightening and worth every minute (pictures to follow in future posts). Coconut image source : Vtraco.com We've also managed to finish work in our garden and 20 month old Baby A finally has his own little play area with a Sand and water pit, garden patch, and a messy area. After a hard day in the garden, Baby A will happily wolf down one of these coconut squares, often asking for more. Hubby too says these are one of the best cakes ever made, and to prove it, has hidden the cake box from me..hehe (its a good thing in one way, keeps my calories in check). I did manage to bake a few more and take them to work and to Baby A's nursery. 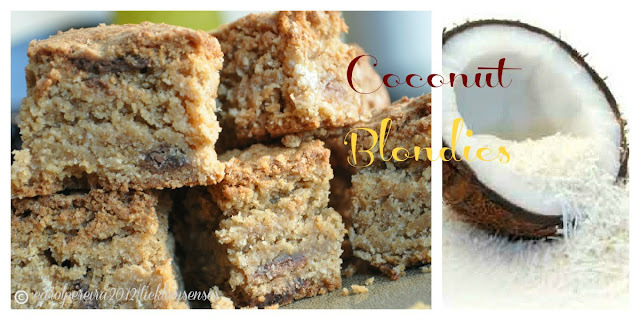 End results...lots of praise and recipe demands :))) so here it goes..
Todays absolutely heavenly recipe for Coconut Blondies with white and dark chocolate chips is another winning recipe from the Queen of cakes "Linda Collister. I've tried so many of her cakes, and each of them have been delightful. My most recent one being Apple Cake with almonds (recipe coming soon). These coconut blondies are sweet, chewy and moist on the inside, with a wonderful coconuty crunchy crust.... a perfect sweet treat for those who love coconut. For those of you wondering what a Blondie is? Here is an insight from Wiki. 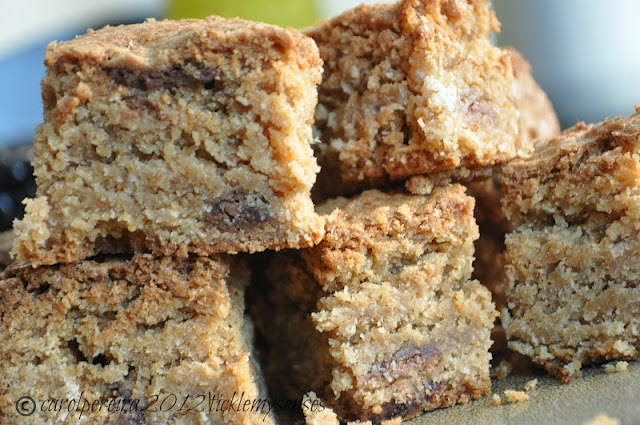 A blondie (also known as a "blond[e] brownie" or "blondie bar") is a rich, sweet dessert bar, made from flour, brown sugar, butter, eggs, baking powder, and vanilla. Blondies resemble the traditional chocolate brownie. They are baked in a pan in the oven similar to how traditional brownies are baked, then cut into rectangular shapes for serving. Like brownies, blondies may include chocolate chips. They may also contain coconut, nuts, toffee, or any other chunky candy for added texture. 1.Preheat the oven to 350 degrees. 2. Grease and flour a 9- by 13-inch pan. 3. Put the shredded coconut in a baking dish and toast in the oven for about 5 minutes, stirring once or twice, until lightly browned. Watch carefully, as the coconut can go from brown to burnt quickly. Remove from the oven and transfer to a plate to cool. 4.Melt the butter in a large vessel over low heat. Remove the pan from the heat and stir in the brown sugar with a wooden spoon ( make sure the vessel not hot/ alternatively transfer the sugar and butter mixture to a large mixing bowl). 5. Gradually beat in the eggs, then the vanilla extract. Sift the flour, baking powder and salt into the sugar mixture and stir until only a few streaks of flour remain. 6. Finally, work in the toasted coconut the white and semi-sweet chocolate chips. When everything is thoroughly combined, transfer the mixture to the prepared pan and spread evenly. Bake for about 20 to 25 minutes, or until golden brown on the top and a skewer inserted halfway between the sides and the center of the pan comes out just clean. Do not over bake, as the best bit of this is their chewy centers. Leave to cool completely before removing from the pan and cutting. Store in an airtight container. Consume within a week. I love coconut candy which is a famous sweet in malaysia that looks similar to ur coconut blondies. Its made with coconut, condensed milk, sugar and a little butter. I'd love to try ur recipe. The pictures look so inviting. Tks for sharing. Hi Carol, these look so lovely and the photography is terrific. You mention a chili festival in the UK; I wonder if that is like the Texas-style chili con carne we know here in the USA. I wrote a recipe for it myself. I assume the Dorset festival fare was similar. 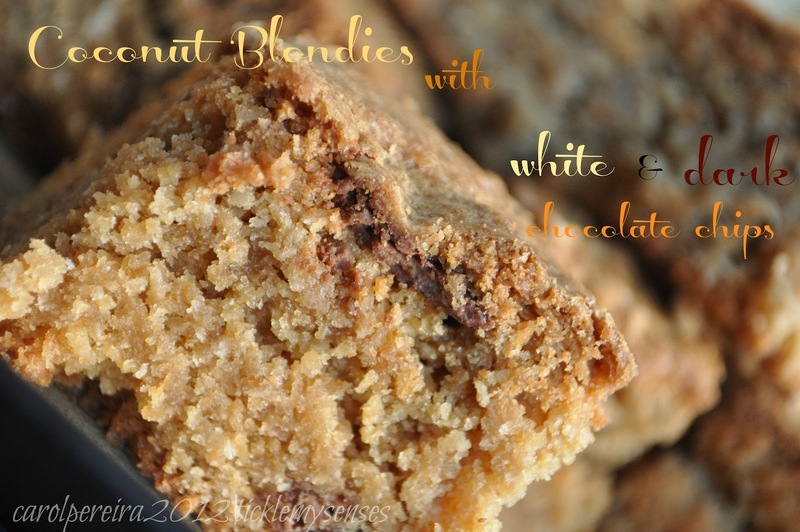 I made burfi, will try these blondies too. Hi Anthony, warm welcome back!! Thankyou for your lovely comment. We are all good thankyou for asking. Mangalorean Black Channa/ Sonay Sukke.